"Flying at 5th Wall is a joyous exploration of the art of the impossible." Do you want to Fly? Do you want to have an insane amount of fun and get a phenomenal workout without even realizing you're working? Do you want to do things you never new you could? You can! We'd love to show you how. Sign up to have a beautiful experience you will talk about forever and get totally addicted to. This is a 2 point harness class: We cover the foundations needed to flip, spin, travel and spiral-fly safely in the harness. From here we'll place you in the right group for you to learn much, much more. Classes are held by appointment. No experience necessary, but this class moves more quickly then the Adventure class. Perhaps you're into circus, but new to harness. Perhaps you're a dancer looking to try aerial. In this class you'll learn the basics of 2 point harness and move quickly into choreography and more. Or if you've taken our class before; we will dive into the good stuff and get you feeling really confident in the air. Do you want to work out like a gymnast? This class uses core gymnastics techniques to bring your strength and agility to the next level. Using essential gymnastic apparatus like: rings, paralette bars, and floor exercises you will gain strength and flexibility you didn’t know you had in a safe and encouraging environment. In these classes you will learn to apply basic acrobatic skills like: rolls, cartwheels and handstands (and even front and back handsprings) modify them and use these skills smoothly and confidently in dance sequences or character moments. This session meets you at your acrobatic level. From no experience to advanced professional. We'll use mats and spotting equipment to develop your skills safely and gradually. Learn the very basics & building blocks of acrobatic movement. Gain strength & work towards incorporating acrobatics into practical dance or acting movement. Example: Rolls, Hand Stands, Cartwheels. Transform and expand existing acrobatic movements into unique dance passes & create supporting choreography. Example for dancers: A succinct & fluid acrobatic pass for an audition or show. * Basic props can be incorporated if desired: chairs, table, broom, or other props. Transform acrobatic moves into fluid passes applied in the way you need. Gain mastery of your back handsprings, front handsprings, walkovers and flips. Learn unique entrances and exits expanding your repertoire. Can be used in a dance floor passes, acting scenes, or using props. This is a private series tailored for you to strengthen and lengthen with moments of flight and always a sense of play. We will focus on balancing your body's needs, moving safely through your limitations and expanding your abilities. Aerial Core - Inspired by Pilates, physical therapy exercises and dance; using hammocks at multiple heights for reformer-like challenges and inversions. You wont find this class anywhere else. These classes are strengthening and lengthening with moments of flight and always a sense of play. We'll move back and forth between deep core strengthening and gentle but effective stretches to balance your body. These classes are vitamins for movers, excellent cross training for all those tiny stabilizing muscles and fun too. New to aerial? 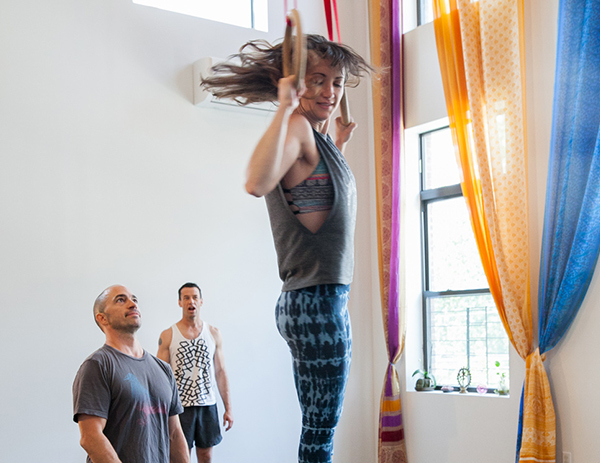 Learn the basics of flight in a class designed to cultivate strength and confidence with an eye to make sure you leave feeling calm and blissed out. This class is structured like a yoga class and ends in relaxation. This class is for anyone but you’ll probably have more fun if you wear leggings that cover the backs of your knees. 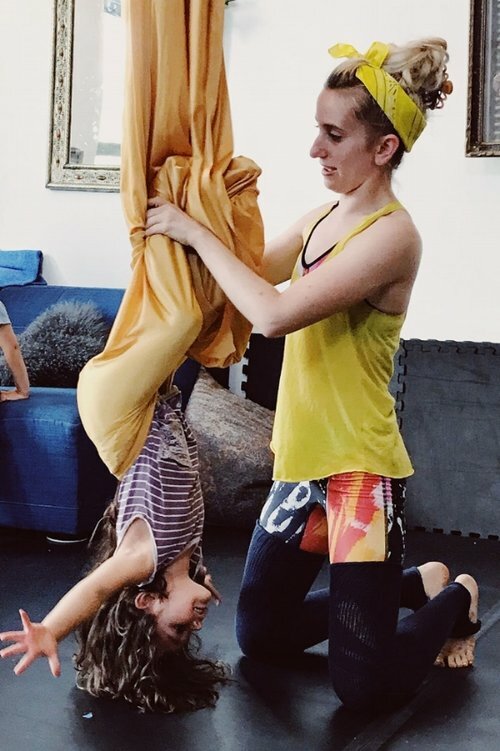 Let your kid express all their Monkeyness in Fly Classes at 5th Wall Studio! Kids will learn balance, confidence and have a blast on silk hammocks, Lyra and other apparatus. 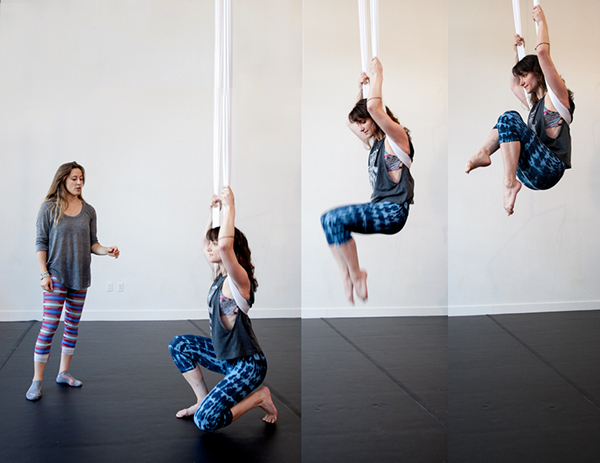 Let your kid express all their Monkeyness in Fly Classes at 5th Wall Studio! Kids will learn balance, flexibility, confidence and begin to gather a repertoire of tricks on silk hammocks, Lyra and other apparatus. TBD. Email the studio for interest! Let us know how old is your kid and what day/times work best for your family. Float away into a trancelike state of deep healing and elevated consciousness as you are bathed in the sounds of Glendy Yeung's healing music, while being suspended in the cocoon-like comfort of silk hammocks. Delight in your senses. Feel balanced inside and out. We can all attest to how a song can instantly transform our mood. Sound, being vibrational, is well positioned to influence our body, mind and emotions. In a Sound Bath you release stress and lower your vibrations as your body synchronizes its own internal rhythms aided by healing sound frequencies. These frequencies rejuvenate the body and bring your brain waves into theta state where deep relaxation, inspiration, profound creativity and a sense of deep spiritual connection with the universe can be experienced. Every sound journey is unique. The healing, relaxation and rejuvenation that can be experienced in this practice is accessible to all. How does one hour of finely tuned self-massage combined with the divine scents of essential oils sound? We’ll guide you through healing foam roller techniques you can use for life to unwind knots and tight muscles, enhanced with essential oils that transport and heal. This class is a special treat to balance your body and mind. Taught by Angelica Kushi and Gwyneth Larsen. Can't decide which class to take? Try our Studio Wide Intro Pack for new students- 2 weeks of unlimited group classes and 2 fly classes for $100!